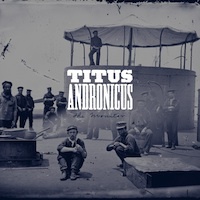 Titus Andronicus’ music addresses the battle within ourselves. A caveat before reading further: Titus Andronicus’ frontman Patrick Stickles’ comments came under the influence of having not slept in 26 hours, after he and the rest of the band drove over night from Toledo to St. Louis to play on a hot Saturday afternoon at LouFest. It was just two years ago that Titus Andronicus, which hails from Glen Rocks, New Jersey, began to break through the oversized, amorphous cloud that is the U.S. indie music scene with their XL Records debut The Airing of Grievances, an LP that captured their rowdy, raucous anthem-punk style. The “other record” is sophomore effort The Monitor, released by XL this past March. While it continued in the same rambunctious fashion as their debut, the album is sprawling — more than an hour long with half the songs over seven minutes in length, and one clocking in at a whopping 14 minutes. The recording also expanded on the band’s low-fi punk sound, adding new instruments (bagpipes, fiddle, trombone, cello) that elevated these epic, drunken, Celtic-flavored sing-along ballads to a level as grand as the album’s so-called Civil War theme, which Stickles said shouldn’t be taken too literally. “The music is set in modern times. The Civil War is only used allegorically; I thought it would be an apt metaphor,” Stickles said. In fact, the lyrics on The Monitor (named after the Civil War-era battleship) are both self-flagellating and confrontational, with slogan-like lines “Baby we were born to die,” “You’ll always be a loser,” “I was born to die like a man,” and most central to the album’s theme: “The enemy is everywhere.” Booze provides a lyrical counterbalance to desperation and hostility. Stickles said the band has never played in Omaha, but heard that the city’s punks “like to rock out in the basement.” He also said he and his high school pals grew up listening to Saddle Creek Records, which opened the door to the next line of discussion. There are probably 100 reviews of The Monitor online and in print, and I venture to guess that at least half of them compare Stickles’ rambunctious vocal style to Omaha’s very own Conor Oberst, from the overdriven screams to that distinctive Conor bray. As for the comparisons, “I’ll tell you because you rep the Omaha readership,” Stickles said. “I think it’s a little short-sighted. It will indeed. Now go get some sleep. Titus Andronicus plays with Free Energy Thursday, Sept. 16, at The Waiting Room, 6212 Maple St. Showtime is 9 p.m. Admission is $10. For more information, call 402.884.5353 or visit waitingroomlounge.com. 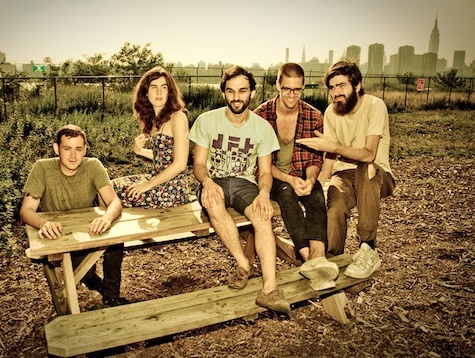 Opening for Titus Andronicus at The Waiting Room tonight is Free Energy, a hot hot hot new indie pop band from Philly that sounds influenced by ’70s arena acts like Cheap Trick, The Knack and yeah, Thin Lizzy, along with a healthy dose of Pavement. 9 p.m., $10.